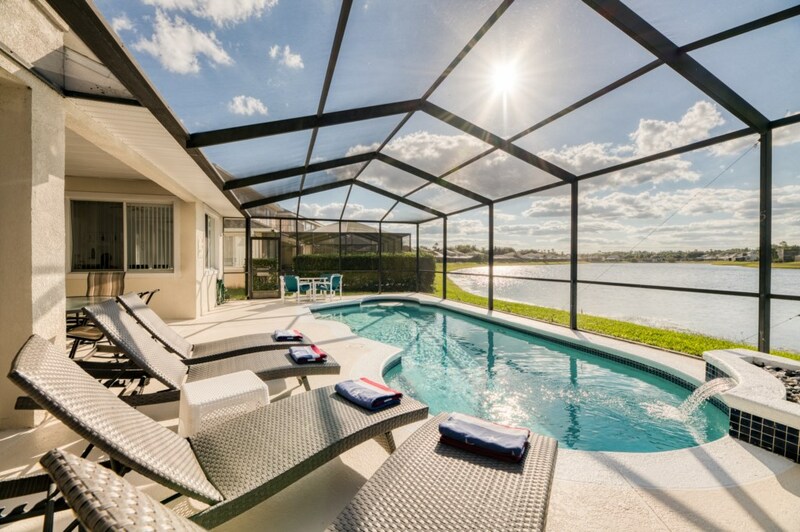 5 bedroom, 4 bathroom villa in the Sunset Lakes community. Owned by Dawn and Alan Murray. Ref: 3499. Hello! We are Dawn and Alan Murray from West Sussex in the UK and have 2 children - now 19 and 13. We had been holidaying in Florida for many years (even before the children came along, we just love it! ), and after renting a villa for the first time, we knew a hotel would no longer do, so in 2003 we set about searching for our perfect villa. When we first stepped inside Villa Sunrise Dream and saw those lake views and realised how close we were to the parks, we were hooked - nothing else would do, and the following month our dreams became a reality, when we completed and the villa became ours. Since then we have been visiting at least twice a year, and nothing beats that feeling of arriving at Sunset Lakes each time. As the time went by I loved sharing our home with guests, hearing their reactions and being part of making their holiday one in a lifetime, so much so that in 2011 we bought our second villa on Sunset Lakes, Villa Sunset Dream and completely renovated top to bottom, using all we had learned from Sunrise Dream over the years to make Sunset Dream equally as stunning and welcoming. I now have have the perfect excuse for shopping to my hearts content to ensure the villas are in tip top condition all the time - what could be better!! Our wonderful family owned Management Company look after the villa and our guests 24/7 in our absence, so you will always be in safe hands when you are there. We welcome lots of questions about Florida and the villas, so please feel free to get in touch and ask away. For privacy reasons, the marker on the map shows the Sunset Lakes community location and not actual villa location. 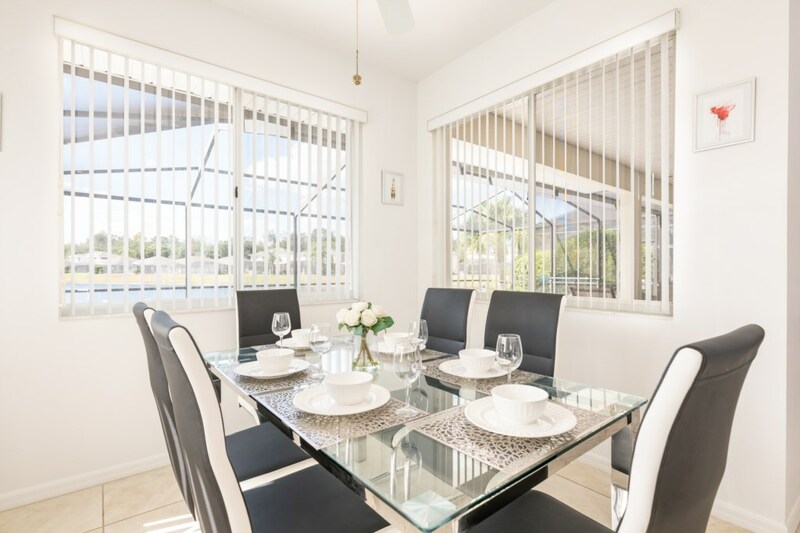 In the perfect location, and only 4 miles -less than 10 minutes to the Magical World of Disney Villa Sunset Dream is our newest, completely renovated inside and out villa on Sunset Lakes. Set on the exclusive community of Sunset Lakes, in the much sought after Formosa area, our Florida home, Villa Sunset Dream, is perfectly located, within minutes of the magic and entertainment that is Orlando, and yet is a peaceful haven of tranquility of comfort and relaxation, with stunning lake views to return home to and enjoy. Sunset Dream is equipped with every amenity you could need and is bright and spacious with your own large swimming pool and seperate Hot tub with superb views of the lake and wildlife. We know how important it is to cater for the whole family, and with this in mind we continually review and update our amenities so there is something to cater for all ages and tastes, to ensure a relaxing, enjoyable and memorable vacation - you deserve it! Our beautiful lakeside home offers over 2600sq ft. of living space, so our home will never feel crowded even when you are with groups of family or friends. 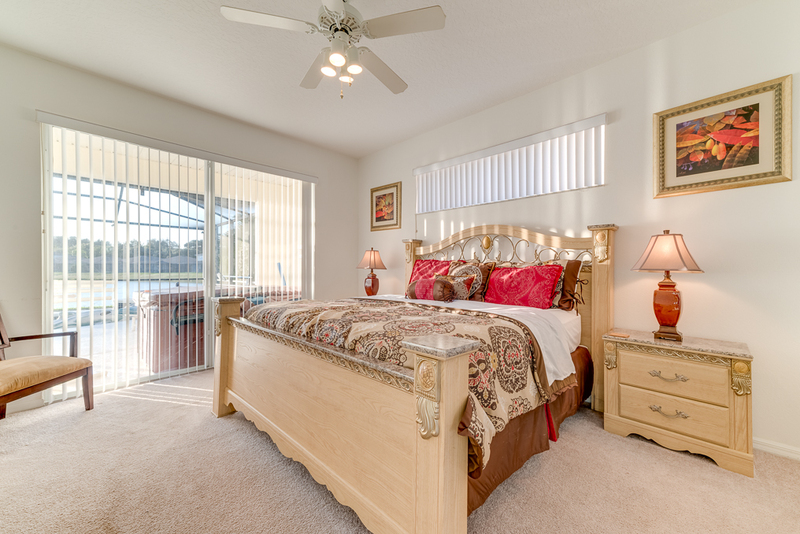 We have 2 King Master suites, one on each floor, a Gamesroom and a 30 ft private pool and seperate Hot Tub overlooking the lake, as well as a private balcony, rarely found in Florida homes with wonderful views over the lake. Our home is beautifully and tastefully decorated and thoughtfully equipped to ensure you enjoy your time as guests in our home and will want to return again and again. Sunset Dream provides the perfect haven after exploring the endless attractions this area has to offer. Our home is close enough to the attractions to return to for a leisurely lunch and cooling dip and rest, before heading back for your evening entertainment or show. Or why not have a lazy day enjoying your pool and home comforts. Villa Sunset Dream is a spacious 2600sq ft 5 bed, 4 bath luxury home with 2 KING MASTER SUITES and 30ft. 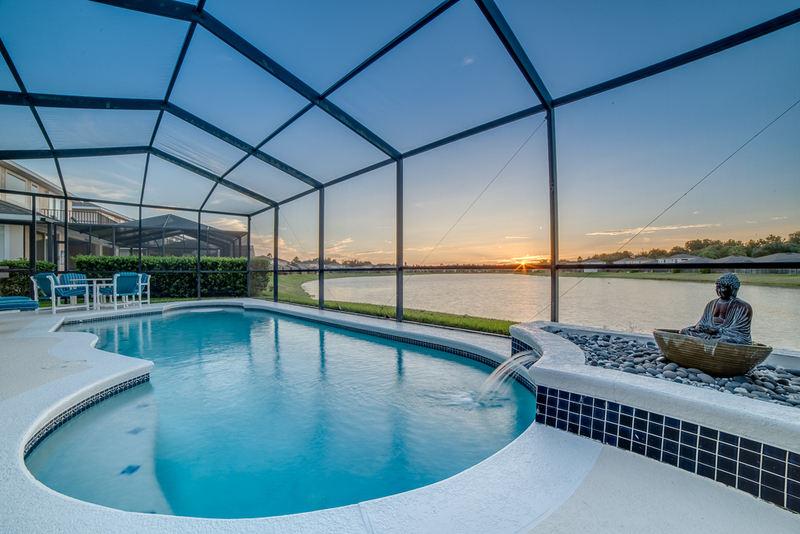 private pool, seperate Hot Tub and Gamesroom on the exclusive gated community of Sunset Lakes, only 4 MILES TO DISNEY- so close you can almost touch it! To the front of Sunset Dream is conservation land, while the pool area looks onto a stunning lake - home to many varieties of wildlife, birds and of course fish (you are welcome to fish in the lake). Each enormous King Master Suite has a huge en-suite bathroom, with luxurious bath, walk-in shower, toilet, twin vanity units with Hollywood style spot/dressing room lights over, walk-in closets, and towel closet with a plentiful supply of towels for your use as well as luxurious bathrobes for your use- go on pamper yourself! The Second Floor Suite is a perfect luxury retreat, with King Four Poster Bed and its own private balcony overlooking the lake (the perfect spot to enjoy your morning coffee or nightcap and enjoy the peace and tranquility of the lake). You also have your own TV, DVD and clock/radio. The Ground Floor Suite also has a King Four Poster Bed and has its own patio doors to the pool (great for that refreshing early morning dip - just open your doors and jump in!!). You can also enjoy your own private cable T.V with DVD. The Queen bedroom has a sumptuous feel, fitted closets, an armoire, bedside tables, Flat Screen TV, with wonderful conservation views for you to wake to. The family bathroom is conveniently next door. The Upstairs Twin with stunning lake views has a fitted closet, chest of drawers and bedside table, and is decorated in neutral colours to suit all ages. There is also a Flat Screen Cable TV and Playstation 2. The Family bathroom is next door. 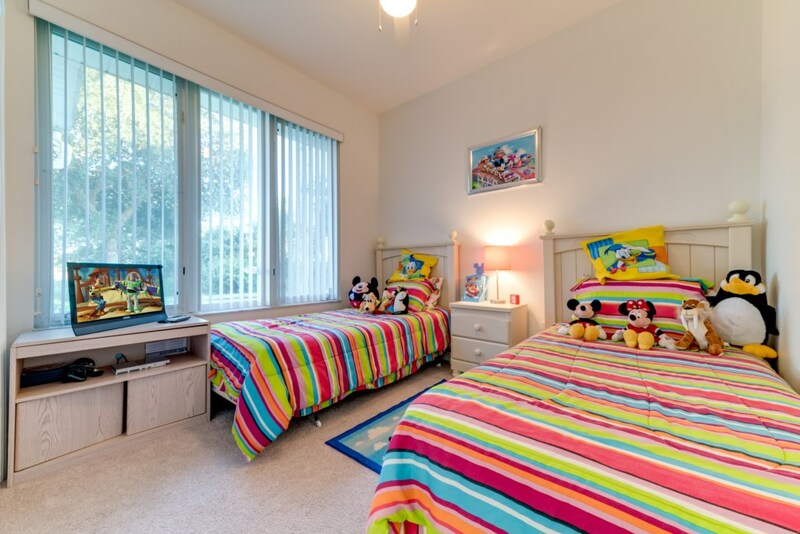 The family, Disney themed bathroom is perfectly located between the upstairs Twin and Queen bedrooms and has a bath, shower, vanity unit with spot/dressing room lights over, towel closet and hairdryer. * Additional downstairs shower room with toilet and vanity unit. Our large private pool is oversized with steps gently leading to the shallow end so that swimmers can really have a proper swim or just enjoy cooling off. The colour changing light creates the perfect ambience for chilling by the pool in the evenings. There is a table and seating area within the pool, and a spacious deck with a plentiful supply of sun loungers and chairs. 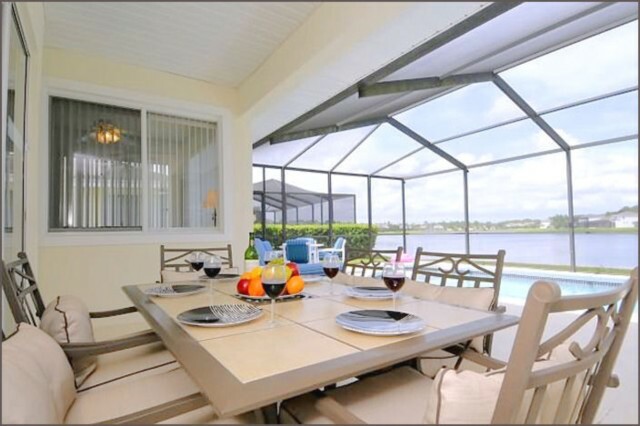 The covered lanai(for some welcome shade from the wonderful Florida sunshine) has a cooling fan and large designer dining table and chairs - perfect for al fresco dining as the sun sets over the lake - a Gas BBQ/Grill is provided. 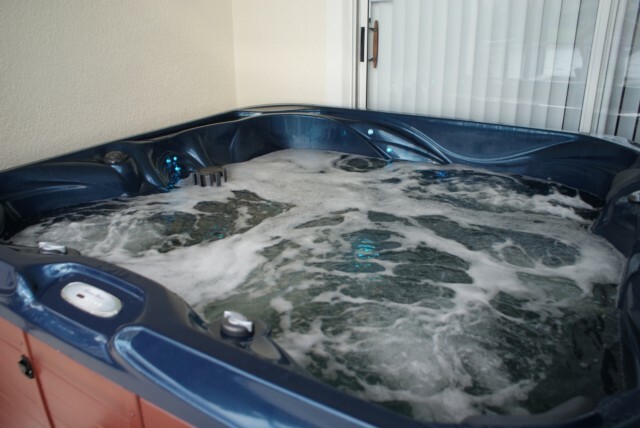 * Hot Tub/Spa - what better way to ease your tired muscles at the end of another perfect day than to relax in our warm bubbling Hot Tub while enjoying the lake views? The hot tub has a gentle waterfall and colour changing lights - heaven! 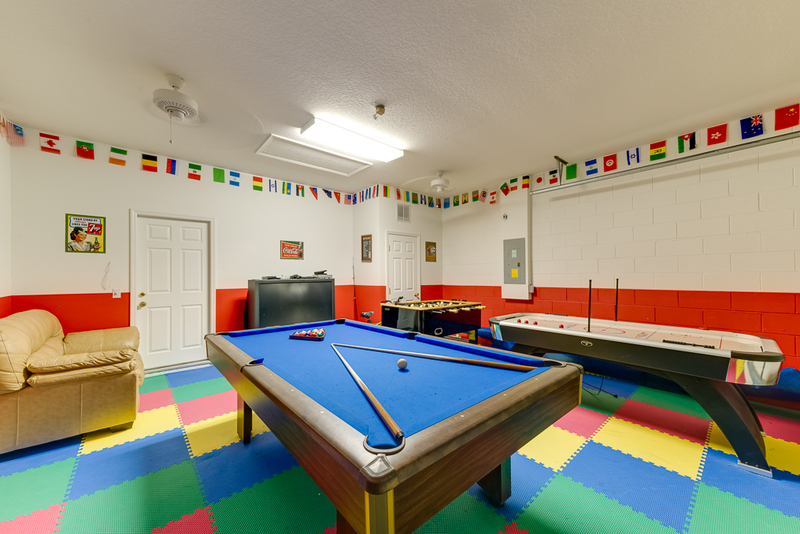 The brightly coloured Games Room has an 8 ft Pool table, 7ft Air Hockey Table and Foosball, 62" TV, and Playstation2. There are also 2 ceiling fans for when the competition gets hot! Our wonderful, spacious kitchen is open plan to the family room, so no-one is excluded from the fun and socialising. The kitchen comes with large american cooker/oven/grill, microwave, dishwasher, waste disposal, fridge/freezer with ice maker, toaster, coffee maker, blender, cooking utensils, cutlery and crockery. The sink/waste disposal and dishwasher are situated on an island/breakfast bar with stools. There is also a good selection of outdoor plates and glasses for use around the pool area. Your seperate utility room has a large, separate washer and dryer, iron and ironing board - no need to take suitcases full of dirty washing home. This lovely area with lake views is perfect for family mealtimes or that special occasion. The heart of our home. Relax on our comfortable and stylish leather sofas. Entertainment includes Flat Screen TV/DVD, Netfix TV on demand, Wireless Internet Connection, Stereo/CD system, Board games, Jigsaw puzzles, and library of books for all ages and tastes. Your formal lounge area is the perfect place for some chill out time. Sink into the plush sofas, grab a book from the bookcase and relax. There is also a childrens play area,communal swimming pooland fishing dock at Sunset Lakes - a great place to meet and say hello to your neighbours. The spectacular lake is home for all different kinds of wildlife and fishing is allowed - fish from your own back yard, or simply admire the birds and other wildlife from your prime viewing position on the deck in the sunshine or as you swim in the pool. 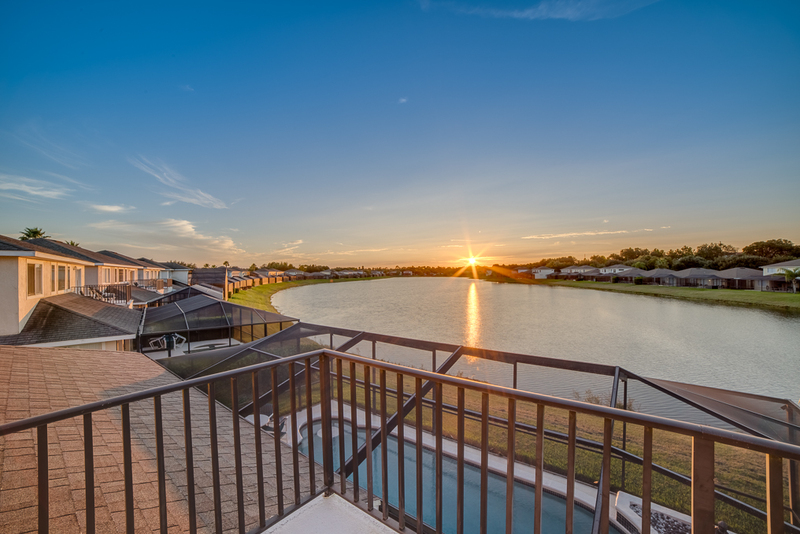 Sunset Lakes is located on west Highway 192, and 4 miles from Disney Maingate. At Formosa Place and Rolling Oaks (5 minutes away) you will find TGI Fridays, Longhorn, Bahama Breeze Carrabas, Giordinos, Outback Steak House, Subway, a Winn Dixie Supermarket and various shops and many more restaurants. For those who enjoy some retail therapy you will be spolit for choice, with brand name factory outlets and wonderful shopping malls such as Florida Mall and Premium Outlets close by. Cocoa Beach - the closest beach to Kissimmee, taking approximately 1 hour to drive. The Gulf Beaches such as St.Petersburg and Clearwater with their beautiful sandy beaches are 1.5-2 hours away. Busch Gardens in Tampa is an easy drive, taking approximately 1 hour on the I-4 and well worth the visit. The Kennedy Space Centre is 1 hour drive away - a must for all those budding astronauts. Port Canaveral, from where you can join a luxury short cruise to the Bahamas is 1 hour drive away. A fine selection of golf courses are nearby. From car hire to attraction tickets, days out to supermarket locations - we are here to help you, just ask, we aim to make your experience at Villa Sunrise Dream the best! This really is the perfect place for your dream vacation, with so much to do and your luxury tranquil villa retreat to relax and enjoy who could ask for more? We had a lovely time! Your home is beautiful.....we didnt want to leave. Cant fault your home...... it is very accomodating and very close to the parks. The sunsets were amazing, the hot tub and pool just brilliant. I will definitely recommend your home to friends and family and maybe in a couple of years come back and stay again----- Ill start saving now! Thanks again for making our stay at your home so memorable. Thanks for the email, we had a fantastic holiday thank you, the villa was absolutely excellent. It was really spacious, meaning the entire family could spread themselves out nicely.As you are aware it was my retirement treat to my family so we only actually took one child who was only six weeks old, she was a little too young to appreciate the parks. The games room provided the scene for evening family tournaments and a league, the pool area was also really well used. The location was really good and once we mastered the shortcut to the Disney parks we were able to get there and back really quickly. A couple of us went out for morning runs down to the 192 and back, it was lovely watching the hot air balloons rising from the distance to the front of the villa, and the sunrise and sunsets were lovely. The villa was really well equipped and we would really like to return for a slightly less hectic holiday in the future. It was a bit difficult trying to fit in all the parks in just 2 weeks. I recently had the pleasure of staying at your villa the first couple of weeks in June with my brother, Mark Young and family. I wanted to drop you a quick line to say how fantastic your villa is, it was perfect, we all had such a great time. The view of the lake from the villa either early morning or after a day of walking around the parks was just gorgeous, a prime spot for watching the crazy lightning storms! It was my first time in America and absolutely loved every minute of it and will definitely be returning to go to all of those places we never had time to visit and hopefully your villa will be available. Sunset Dream villa was all and more, A very spacious Villa with all the needs for a family vacation.A swimming pool overlooking a great view, where we watched the wildlife going about there everyday routines.The Disney Parks are ideally located for this villa, only 15mins away, which is ideal as less travelling is more fun to be had at the parks.There are also plenty of great places to eat close by and of course a visit to the old town is a must, which is located only 15mins away also.All in All my family and friends all enjoyed this spectacular villa and location and will recommend this to anyone. We had a fabulous holiday, the villa was great, the weather was good, we had no complaints, and were amazed how well equipped and everything you could possibly need was there. 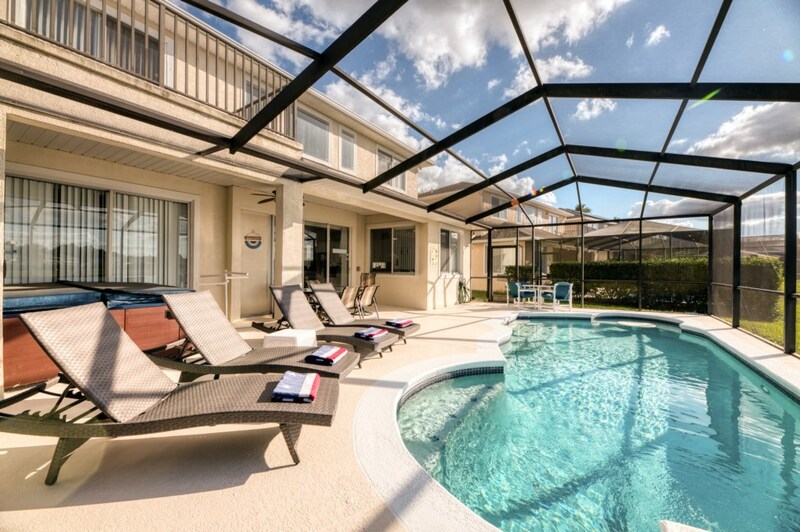 Being so close to Disney we didnt spend enough time at the villa or around the pool, think you really need 3 weeks. If I did have a complaint it would be the holiday was not long enough. Just to let you know we have arrived and are so pleased. Your house is amazing and it has outdone our expectations completely. The kids have not got out of the pool yet! Wished we had found your villa first - would have saved a lot of time trawling through other villas. Weather was exceptional and the hot tub was an absolute treat, especially watching the sunset go down over the lake. Just wanted to let you know that we totally loved the villa. The house is amazing and so is the location. We couldnt have asked for better. There was more than enough room for everyone. The pool was beautiful and the hot tub everyone used happily. We would definitely recommend the house to our friends!!!!! Again thank you so very much for the use of the house!!! We stayed at Villa Sunset Dream in December 2012. There were four of us and we have 2 teenage boys. The villa is perfect for children and provides lots of space and things to do. The villa was lovely and clean. It provided more than the norm with regards to extras. The Games Room is excellent and the outside area had lots of pool toys. The layout of the house would easily accommodate two families comfortably. The area itself was quiet and private with a lovely peaceful view over the lake from the pool area. Just wanted to say what a wonderful time we had in Florida. The villa was fantastic, the kids loved the pool and the games room. It had everything we needed. Your Management Company were fantastic when we had a problem with the pool temperature and arrived within 20 minutes and sorted the problem straight away. 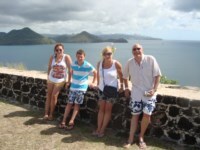 Thanks again, we had a fantastic time and will recommend your villas to everyone. 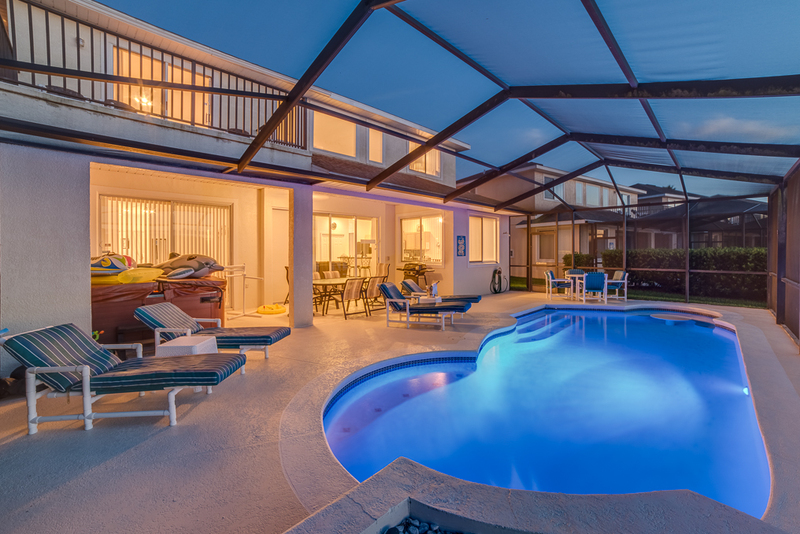 We have just returned from an amazing fortnight in Florida, staying at the beautiful Villa Sunset Dream. Dawns friendly and prompt response to every minute (and probably annoying!) query we had before even setting off on our holiday really was second to none service. She also arranged the provision of additional items that werent already in the villa, a true extra mile which was very much appreciated. 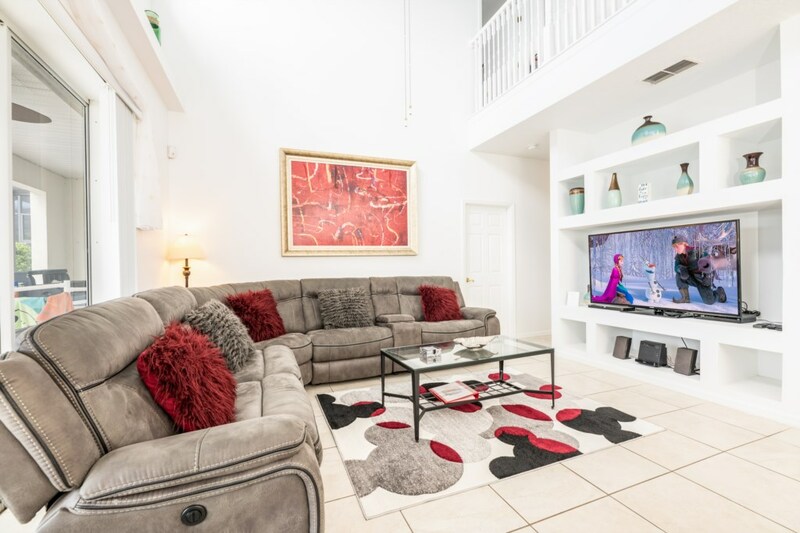 The villa is exactly as described or better in fact with wonderful pool in a lovely setting, which is so hand for the airport, Disney and the other parks/shopping that we would not ever consider staying at a Disney resort now. Home from home and freedom from the crowds and hustle and bustle. We cannot recommend Villa Sunset Dream enough for your holiday and we will definitely be returning with the family from Scotland and Australia. Thank you for helping make our kids first Disney holiday a dream!! Due to the popularity of Villa Sunset Dream, early booking is highly recommended. To avoid dissapointment please enquire as soon as possible as available dates for 2019 are limited. We are now taking reservations for 2019/20 - enquire now! Hot tub heat is GB£5/US$7 per day. Pool Heat is available on request for GB£15/US$25 per day. Stays of less than 7 nights incur an additional cleaning charge of GB£80/US$120. A reservation deposit of 25% of the total price is payable to secure your preferred dates. A refundable security deposit of GB£300/US$400 or non refundable Accidental Damage Waiver of £50/$75 is payable with your final balance. Payment may be made by GB cheque, US check, electronic or wire transfer. Payment may also be made by credit card from any country with a service fee of 4.0%. Dine with a view Relax and Rejuvenate! Fab pool and view Queen with conservation views Dine with a view! 28 Apr 2019 to 04 May 2019 - use the form below to enquire about these dates. 03 Jun 2019 to 11 Jun 2019 - use the form below to enquire about these dates. Average rating: 5.0 / 5 from 22 reviews. We have been going to Florida for over a decade and this is by far the best villa that we have stayed in. Beautiful decor all around the home, both huge bathrooms have been completely refurbished and they are stunning and there is a hot tub outside close to the 30 ft swimming pool. Villa owners could not be more helpful and friendly (they even left a bottle of prosecco in the fridge on our arrival to celebrate our twin girls 21st birthday the day before ??). Villa is very close to the 192 so perfectly situated for parks like Animal Kingdom and lots of fantastic restaurants. Faultless ?????????? Villa Sunset Dream was everything we had hoped for and more! As a part of 5 adults we were keen to book a villa that had enough space for all of us and we certainly chose the right one, Sunset Dream is huge! Each bedroom was very spacious and the two that had en-suites were amazing, we all said that we've never seen bathrooms so big. The villa was very clean and tidy with a lovely open plan design downstairs for the kitchen (which was really well stocked with cutlery, crockery etc. ), living area and hallway. The large TV is a smart TV that has all the modern on demand apps installed which was great for the occasional evenings where we didn't feel like going out. The highlight of the villa though for us (and i'm sure for most guests) was the pool! It was so much bigger than what we expected and you could easily swim in it, rather than just splash around. Overall we can't praise this villa enough, we've been to Florida a number of times now but this was our first time staying in a villa...it certainly won't be our last though! We would struggle to think of a reason why we wouldn't book one of Dawn's villa's next time either. 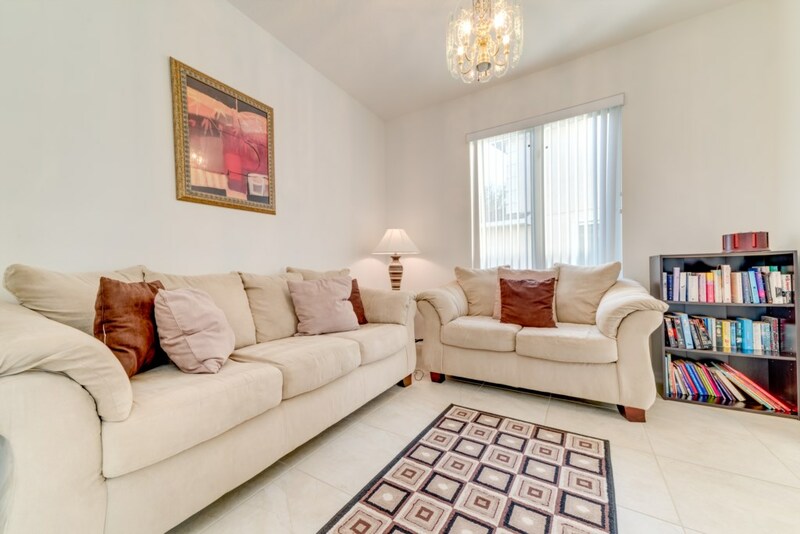 They are in a superb location on a lovely complex, Animal Kingdom is the closest Disney Park which is just 10 minutes away (without traffic). Thank you Dawn for letting us stay in your lovely villa and we hope to visit again soon! Great house with everything you need! My family of 7 (4 adults, 3 kids) just returned from a wonderful stay at the Sunset Villa. The house itself was very clean and had absolutely everything that you need. Great living room/kitchen area that was very open with plenty of room for all of us. Bedrooms were all roomy and beds were comfortable. We had asked for the pool heat to be on and it was definitely warm. I have stayed at previous places and requested the same, however the pool still seemed a little chilly....not this time! Lots of patio room for lounging as well as outdoor dining. There is a nice little lake behind the house that provides lovely views. It's nice to not be starring at another house directly behind you. The kids did some fishing and managed to catch one small fish. Dawn and the management company were absolutely delightful to deal with. Dawn was always extremely quick to reply to any questions and was always accommodating. We had to call the management company on our first night there when we couldn't get the pool/hot tub to turn on. It was a simple timer that can be adjusted depending on when you want to use the pool the most. The management company came to the house within 10 minutes of our phone call, and were terrific and friendly." Thanks so much Dawn for sharing your lovely home with us. We really enjoyed our recent stay . 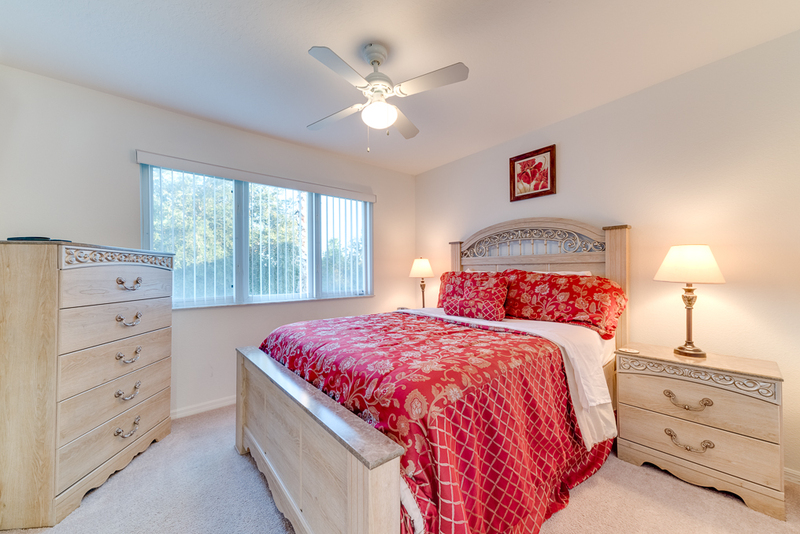 The home is ideally suited for Disney and other Orlando attractions. Unlike many rental homes this one really is close to everything you need. The beds are very comfortable, the outdoor area is lovely with ample seating, overlooking a pretty little lake. It's a very peaceful, restful environment. The grill was new for our stay. Another thing that sets this home apart - the pool really is heated to a wonderful temperature. This doesn't always happen at other rental homes. Thank you again. Everything was wonderful." So we're all packed up and ready to carry on our adventure, just wanted to say a huge thank you for our amazing stay in your spectacular home, it really has been the best place we have stayed. Everything we would need is here, and more, and the kids have said they would love to come back, and our youngest has told his sister he's staying in the big bed next time!!.. They really have loved every minute and the pool has been well used!.. -thanks again for everything. Feeling almost back to normal now and reality is slowly returning after an amazing holiday which is partly down to your beautiful villa. We have been using sunset lakes for the last 15 yrs staying in various different villas along the way and we have to say that your villa, sunset dream, has been the best. The fixtures, furnishings, equipment and layout made it more than a home from home for our party of 7. The villa was spotlessly clean on arrival and there was some nice touches left to help us settle in. The highlight of any villa for us is the pool area and your perfectly positioned large pool deck with plenty of seating and outdoor furniture made this the most popular area. The multicoloured pool lights meant the kids and adults could use the pool late at night. We would also like to mention your management team who we had a lovely chat with during their routine maintenance of the grounds and pool. 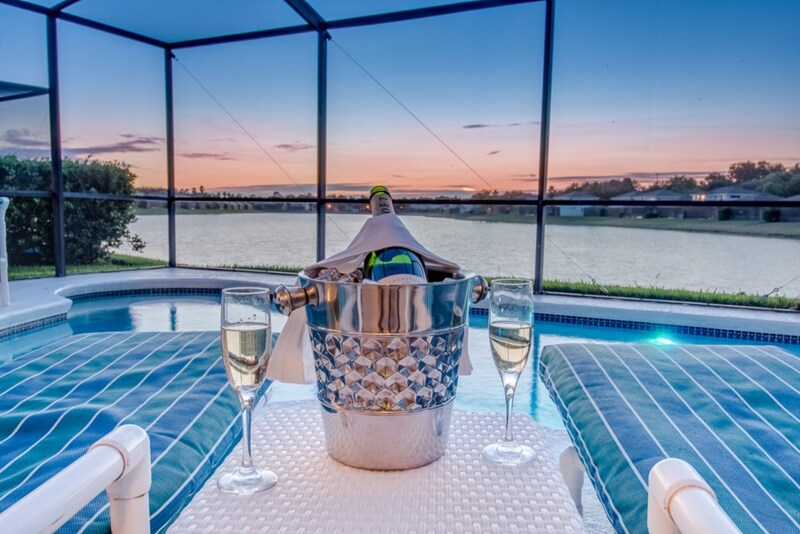 We will for the foreseeable future always return to sunset lakes as a base for our Florida holiday and would without hesitation look to see if you had avaliability of your villa. Thank you for 2 amazing weeks in your lovely home. It was the perfect size for us as 8 adults need to be able to find their own space. Everything was immaculately clean and the beds and sofas were so comfortable, not that we spent much time in them as we were so busy. The bathrooms were great, light and spacious and having 4 showers was a total God send. There was nothing we needed that was not provided and we were really sad when it was time to leave. The pool and hot tub were spot on temperature wise, the sunsets were incredible viewed from the balcony and the pool area and the layout of house lent itself brilliantly to a group. I have stayed in 5 other villas prior to this visit, most have been delightful but i would totally recommend anyone needing 4 – 5 bedrooms to stay in your villa and I am hoping we will be coming back also. Sunset Lakes is a lovely community, quiet after the madness of the parks and extremely picturesque. Additionally I would like to thank you for all your assistance with our booking, everything was arranged with ease and all the details we needed readily available – I just wish we could come back now. I just thought I’d drop you an email to say what a lovely time we all had whilst staying at your amazingly homely villa! My daughter was upset that she had to leave and wanted to stay there permanently!! The sea screamer that you suggested was amazing, we managed to get right at the back and see the dolphins from a few feet away, we spent the whole day there on the beach which was lovely! Thank you so much for providing such lovely accommodation, I will be definitely recommending your villas to family and friends - I’d certainly re-book if we were to ever come back! The villa was very clean and everything worked beautifully. Your home has everything you could possibly need and more - the only thing we missed were egg cups. We would definitely stay at your villa again - this was the fifth time we have been to Florida and stayed in villas, but this was by far the best. Will recommend to friends. Thank you so much for the best family holiday ever. Your home is amazing! Extremely clean and fresh throughout the villa including the external areas like the pool and hot tub. Everything was working except the lights in the pool but not sure if we just couldn't figure it out or if they were actually not working. We were more than happy with the appliances available, we certainly didn't expect to find things such as straighteners etc so don't feel there is anything we can think of to add. Honestly we can't wait to come back! We have already recommended your villa to friends and family. You have a gem of a villa, it's spacious and well presented, we felt very well looked after and enjoyed coming back to the villa after a long day at the parks to watch Netflix or relax in the pool. The views over the lake are incredible, the resort itself is beautiful and everyone we met were incredibly friendly. It's situated in the perfect location with the supermarket round the corner, liquor store, Harley Davidson and Disney literally 5-10 minutes away (the short cut recommended by yourselves was perfect). We can't wait to return in a couple years. The service was outstanding. The owners were always courteous and prompt with their responses and the management team quickly and efficiently took care of the few issues we had. 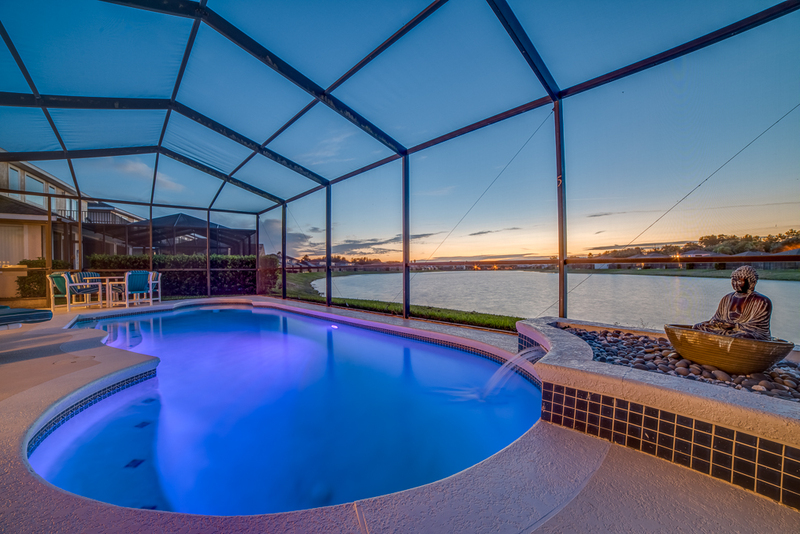 We especially enjoyed watching the sunset over the lake from our enclosed pool and hot tub. The home was clean, full of amenities (even books, games and movies) and really spacious ( 5 bedrooms, several bathrooms, big kitchen, a game room, etc.) We also liked the property's safety features, such as the house alarm, door alarm by the pool and being in a gated community. It was in an excellent location-- only 5 minutes from Disney World and only minutes from several stores and restaurants. There were 7 adults and 2 children in our group. Everyone loved this place! The house was very clean and beautiful. The pool was wonderful! The pool heat was defiantly worth it! I have 2 small children (4 and 2) and the pool was their favorite part! They loved the bedroom with all the Disney dolls! So much was provided for the kids that I didn't even realize! There were toys and all kinds of amenities for them (strollers, high chairs, car seat, pack and plays) it was very nice! The door leading to the pool was child proof which was such a relief. I really didnt have to worry about anything! If you are looking for a way to experience Disney (which was only 10-15 minutes from the house) this is the way to go! The owner answered all my questions in timely responses and was very accommodating!!!! Cannot wait to plan another trip! Everything was great! And clean! Issue regarding bug/pool canopy felt wind blew corner out. Contacted yourselves who got in touch with management company. Prompt response. Great guy who came, no problems or issues raised. Definitely!!!! Villa great!!! Location Great!!! Any other comments/How did you find the booking process? Dawn you were a delight. Totally patient with my million questions. Thank you! Owner's response: Glad to help and have you as our guests - come back soon! 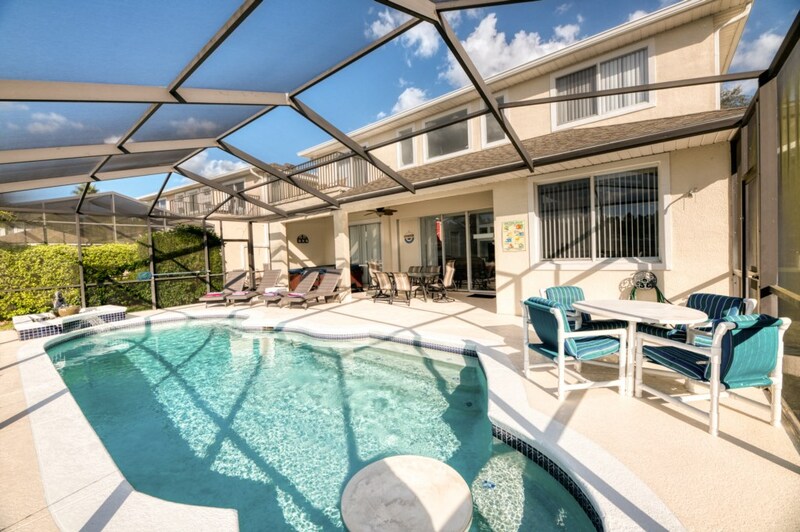 We have just returned from villa Sunset Dream and wanted to let you know what a great time we all had.We have travelled to Florida many times in the past and your villa is the nicest property we have ever stayed in. Everything was perfect including the pool heating which was at the right temp from day one!The hot tub is great and the view from the pool beautiful. Sean from the management company was really helpful and polite .Overall a fabulous holiday and when we return we would love to stay at the villa again. We stayed in the sunset dream between 13/11/15 and 27/11/15. We were a group of 5 adults and twin 6 month old boys. The villa itself was out of this world. It had everything we needed for our 2 week stay. We had stayed at Disney and universal hotels the week before and just didn't feel relaxed at all. As soon as we made our way through the gates of the sunset lakes community we started to relax. The villa is in a beautiful location. The lake view was stunning and so lovely to wake up to everyday. We have been coming to Orlando for years but this was the first time we stayed in a villa. It is unlikely that we will ever be able to enjoy a hotel stay again!! The service provided by Dawn is the best I have ever received. We can't wait to return to this gorgeous villa and would highly recommend staying here to anyone that is considering visiting Orlando. Everything worked, eveything was thought of, even coasters. We would stay again and recommend to friends (I wanted to stay longer). Booking was very easy. All your info was very helpful. We normally stay on Universal Blvd, so this area was new to us. Everything was easy to find. The area was so peaceful. Absolutely love this house! Certainly the nicest we have stayed in and believe me we have stayed in a few! Pity we aren't spending more time here as seen to be racing up to Lake Mary quite often. Beautiful villa with all the comforts you could need and ideal for a family. Resort was great for the kids with a playground and fishing which they loved and it really is only 4 miles from Disney which was very convenient. We would not think twice about booking this villa again and highly recommend it. We have stayed in many villas this was by far the best. Just like to say we had a wonderful time at your villa. The photographs don't do it justice as it feels far more spacious once you're living in it. The facilities are excellent - the kitchen is well equipped, the utility area was very useful and there were plenty of fresh towels. Everything was very clean and well prepared when we arrived. By the way did you know you have a small alligator in the lake. Awesome. Thank you so much.We are hoping to book the villa again in the near future. Thanks for the welcome home email. We contacted Norma early on re the waste disposal and hot tub and she solved both problems over the phone. Would definitely stay again and would recommend to friends and family. Our only regret is that we didn't have as much time as we would have liked to just chill at the villa because we were attempting to see all the parks ( a punishing schedule considering the heat). As you know our group covered a wide age group and everyone enjoyed the villa, the youngsters really loved the pool and the games room and were asking when we were coming back (starting saving !) The whole booking process was smooth and trouble free and the information provided made for easy access to the shops and attractions. Thank you very much for your help and I hope we will be contacting you again in the near future. We are back up in Canada. We thoroughly enjoyed our vacation and were very pleased with the house. We were impressed with the location, the cleanliness, and all the amenities. We will recommend your place to our friends. Thanks! Owner's response: Fabulous, pleased you enjoyed your stay. Your enquiry will be sent to villa ref 3499 only. This page has been viewed 24152 times since 07 Jun 2011.